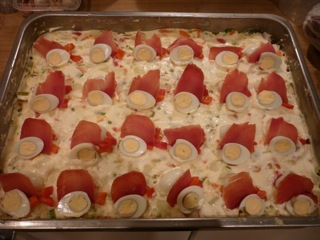 Ensaladilla Rusa by wiki accounts was first created in 1860 by Lucien Olivier of the Hermitage restaurant in Moscow. Me thinks the original - which apparently used venison and cray fish amongst other things - has gone through a few Chinese whispers to reach it's current incarnation. Whenever we went to visit my grandparents in their remote little mountain village for a big old family reunion, this dish would always make it onto the feast menu. Usually in the first or second round served with fresh French stick! That aside, this is how my auntie showed me how to make it, with some small adjustments of my own. I did this one so that it was vegetarian friendly (simply don't garnish with tuna or anchovy) but more often than not tuna is added to the mix, as are prawns, which I prefer. In fact a friend who was eating with us that night said it was perfect but was rather upset about the lack of prawns! Can't please everyone although this one come close. Prepare the ingredients as per the ingredients list. The important thing is to use tinned peas, not fresh or frozen, as they contribute to the texture of the mix, use fresh boiled carrots, and raw spring onions finely chopped into small rings. If you've got the time to roast peppers then that's great but the ones that come in glass jars do a nice job too. You can also do the peppers in a heavy based pan with a lid and some extra virgin olive oil on a medium heat the way my mum does them, turn up the heat just at the end to blacken those sweet little babies off. Question is how do you get that and it's very simple. Firstly don't cut the potatoes up larger than 2cm, 1cm - 2cm is perfect. Smaller than that and you're potatoes will quickly turn to mush. Larger than 2cm and you end up with bits of potatoes too large to eat and the balance of potato to lovely gloop is too potatoey. Put the potatoes into the water and add salt. When the water starts to boil, set your timer for 7 minutes, when it goes off they should be perfect. But check them with a knife to be sure, I usually check them at 6 minutes just in case. Then drain them in a colander for a couple of minutes. At this point you need to fluff the potatoes. Once drained pour them back into the pot, season with salt and pepper, get a large fork, and roughly stir up the potatoes until they're kinda fluffy around the edges. Put the eggs you're going to use as garnish aside, then roughly chop up (or grate) the remaining eggs and add them along with the rest of ingredients that aren't to be used as garnish to the potatoes and mix all together until it's evenly mixed. Check for seasoning and adjust as required. 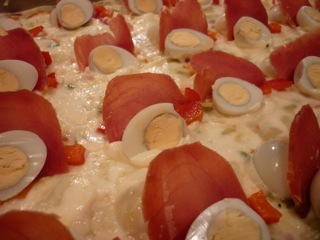 We garnished our with cured tuna, quails egg and piquant pepper. We used Unearthed pork meatballs and garnished the salad manzanilla olives and sun dried tomatoes and prosciutto. You can find the whole 8 course menu we served here. As you can see you can present this in all sorts of ways only limited by you imagination!! Of course if you're a Spaniard or a foodie there's a good chance you'll want to make the mayo yourself so here's how! Tips: You can cook the potatoes with a stock cube for added flavour, this works well if you're doing a really simple potato salad, with, for example just the green part of spring onions. Which is ultra quick and quite tasty. When you put love into you're food people will notice!!!! Mmmm, my favourite Fernandez and Leluu dish. Good to know the secret so I can wow people with it at home. Amazing! I will be trying this this weekend!